Twenty four people are part of three committees which are to look at research, teaching, and administration respectively. No two committees have any member in common. No two committees are of the same size. Each committee has three types of people: bureaucrats, educationalists, and politicians, with at least one from each of the three types in each committee. The following facts are also known about the committees: 1. The numbers of bureaucrats in the research and teaching committees are equal, while the number of bureaucrats in the research committee is 75% of the number of bureaucrats in the administration committee. 2. The number of educationalists in the teaching committee is less than the number of educationalists in the research committee. The number of educationalists in the research committee is the average of the numbers of educationalists in the other two committees. 3. 60% of the politicians are in the administration committee, and 20% are in the teaching committee. 1. The numbers of bureaucrats in the research and teaching committees are equal, while the number of bureaucrats in the research committee is 75% of the number of bureaucrats in the administration committee. 2. The number of educationalists in the teaching committee is less than the number of educationalists in the research committee. The number of educationalists in the research committee is the average of the numbers of educationalists in the other two committees. 3. 60% of the politicians are in the administration committee, and 20% are in the teaching committee. 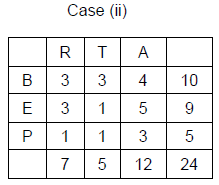 Based on the given information, which of the following statements MUST be FALSE? What is the number of bureaucrats in the administration committee? What is the number of educationalists in the research committee? 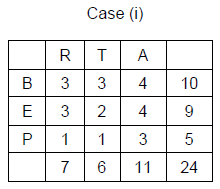 Which of the following CANNOT be determined uniquely based on the given information? Politicians are in ratio 1 : 1 : 3 only value will be 1, 1, 3. Possible value of m, n, o are 3, 2, 4 and 3, 1, 5.